Northern Strands recieves accolades for excellent service! Recently the company, "Concept Group" had round slings made for them by Northern Strands. Soon after, Concept Group sent an email praising Northern Strands service and knowledge . Here is the portion of that email discussing our service. Thank you Concept Group for your high praise of our knowledgeable employees! Northern Strands Warehouse proudly employees some of the most technically trained and knowledgeable employees in the industry. 5.5mm to 26mm in metric sizes. • Large selection of rigging products. Group, Gunnebo Johnson, Thern, Unitex and Vitali. • Vertical and horizontal test bed services. Did you know that Northern Strands is the largest supplier of wire rope and rigging in Saskatchewan? 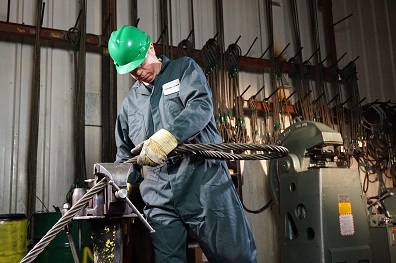 Northern Strands Rigging Division is a full-service facility operating out of Saskatoon and Regina with the ability to fabricate custom chain and wire rope slings up to 1-1/2”. We have a vast inventory of synthetic lifting slings, chain hoists, lever hoists, shackles, trolleys, winches ,tuggers , and other general rigging hardware. Our network of suppliers and in-house expertise is leveraged for the benefit of our customers. Large selection of rigging products. Vertical and horizontal test bed services.